Love it or hate it, Bungie’s space shooter/loot-based RPG hybrid — Destiny — is powering forward and the beginning of its third year is marked by the release of a new expansion. Game Informer’s recent coverage on Destiny: Rise of Iron has revealed a ton of new information about the latest content drop, due out on September 20. From Festival of the Lost and Sparrow Racing League returning later this year, to new artifacts that will grant special abilities and a brand new light level cap of 400, there’s been plenty to get hyped about for fans of Destiny (not to mention Destiny: The Collection for new players). They’ve also announced that portions of Rise of Iron will be playable at gamescom. Those who aren’t attending gamescom, don’t fret! Bungie invited us into their studio a few weeks ago to get some hands-on time with Rise of Iron. One of the PvP additions coming with Lord Saladin’s time in the spotlight is the new Crucible mode, “Supremacy.” In essence, Supremacy is Call of Duty’s “Kill Confirmed” game mode, where in order for a kill to count, a crest must be picked up from the fallen guardian. 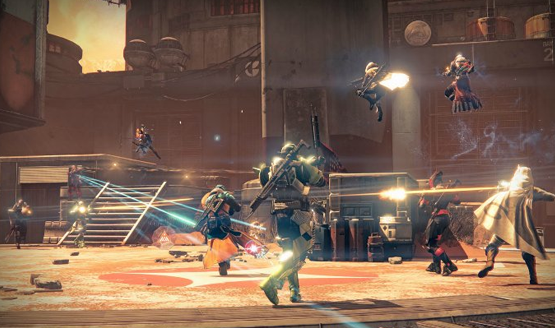 Unlike traditional Kill Confirmed game modes however, Destiny puts its own unique spin on the formula. Instead of being a static pickup at the point of a kill, the crests act much like the PvE’s engrams, physical objects that drop and roll around the environment. To add to the chaos, each crest lasts for a full minute and shows up as an objective on the map for all players. I got a chance to play a number of Supremacy matches on two of the new maps, Icarus (the Sony exclusive map) and Floating Gardens. Icarus — shown in the screenshot above — is a new map on Venus, a solar farm mysteriously untouched by the Vex. It’s a unique take on the traditionally vexing layout of Mercury’s maps, so seeing humanoid structures on the bright golden surface is a fascinating change. Icarus is perfect for Supremacy, being a mid-sized map so the chaos was near constant. The circular design tended to see combatants clashing quite often, and the added effect of crests rolling all over with each kill kept everything in constant motion. The middle area provides a quick route to the other side, but more often than not I found this area to be a deathtrap. It will be interesting to see what kind of meta and strategies evolve on this map once more people get a chance to play it in regular rotation. Floating Gardens is a Vex shrine on Venus where the mechanical Vex go to recycle their worn out bodies. This map is reminiscent of areas within The Black Garden, with clearly Vex built architecture. Pantheon and other Vex-based arenas are some of my favorite maps, and I found Floating Gardens to be very similar in layout and design, while giving its own unique spin for the Rise of Iron content offering. This was another map where the chaos of crests littering the ground from kills caused constant motion and unpredictability throughout each match, especially on the central bridge that crosses a waterfall of Vex “milk” (that white fluid that bursts from their chests when you get a precision kill). During these matches we had each of the new artifacts unlocked, and many of them do benefit team play in PvP, but the brief time was not enough to build strategies and tell how deeply the abilities provided will impact the Crucible overall. Their effects are noticeable enough that it will definitely create some changes going forward for the competitive side of Destiny depending on how players decide to utilize them. Kill Confirmed is one of my favorite game modes because it doesn’t strictly rely on kills or heavily reward sniper play. I’m the type of player that likes to get right in the mess, and running a Leroy Jenkins move straight for a pile of crests that rolled into the fray was a blast, as was hanging back and waiting to pick off players that would attempt to make a mad dash for those same crests. Rise of Iron’s Supremacy is remarkable for its own special take on a classic game mode. Watching crests roll down flights of stairs or off the edge of the map is a decidedly different experience than the static floating dog tags found in Call of Duty. The decision to add them all as objectives on the radar creates a lot of insanity and tough decisions on whether to move for the crests or use them as traps for opposing players. We only got to play the 6v6 mode, but there will be a Rumble (free-for-all) variant as well. We didn’t get a chance to play the other two maps, The Last Exit and Skyline, but if they give us the same kind of interesting new areas while remaining definitively a Destiny experience, then I’m excited to see what they have to offer. We’ll be doing more in depth coverage of each map once Rise of Iron launches and we can see how players use and abuse all four and the Supremacy game mode in general, but until that point, my experience with Destiny: Rise of Iron’s Crucible additions seem to be a major positive move. Add this to the newly announced private matches and the ability to play Supremacy on any of Destiny’s 31 Crucible maps (for PS4 owners), and you’ve got the groundwork for a completely new focus on competitive gameplay in Bungie’s space shooter. For all of the latest coverage and news on Destiny: Rise of Iron, check out our information hub here. We’d like to thank Activision and Bungie for inviting us to the studio to get some hands-on time with Destiny: Rise of Iron.